It's that time of the year again. Stuff the turkey. Puree the cranberries. Corral the family around the table, and pass the sweet potatoes, please. While you're at it, would you dish out a side of hepatitis booster? It sounds like Brave New Thanksgiving. But a cadre of committed researchers are fashioning vaccines inside some of the very foods that grace harvest-time tables everywhere. And it may be here, at the nexus of plant biology, genetics, and immunology, where Hippocrates' celebrated proverb becomes reality: "Let thy food be thy medicine." 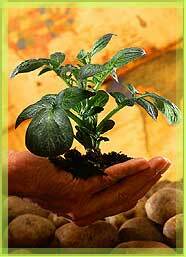 Someday, this tiny potato plant could supply a welcome substitute for the hypodermic. USDA Image gallery (see plants). If everything goes according to plan, edible vaccines could save a lot of lives. The World Health Organization has estimated that four million people die every year from preventable disease. Traditional vaccines are expensive and difficult to store, distribute and dispense. And they are in short supply: Most staple vaccines are already being produced at capacity; there are simply too few to go around. Edible vaccine technology can trounce some of these obstacles, but will they offer a solution to a raging global health crisis? Not everyone thinks so. Add a generous portion of research expense, a heaping side of bureaucracy, and finish with a generous slice of genetically modified worry-pie, and you have an overflowing plate of problems. Charles Arntzen is hungry -- voracious, you might say -- to solve one of the 20th century's biggest scientific failures. The dramatic gains in public health made through the program on immunization have been a lopsided victory, says Arntzen, chair of Plant Biology at Arizona State University. Recent progress in vaccine technology has been one of the great public health victories. Infant immunization rates in some areas now approach 100 percent. But worldwide, only about 80 percent of children get the basics: diphtheria, whooping cough, polio, measles and tetanus. Not surprisingly, the unlucky 20 percent are concentrated in a few poor countries. Each year, almost 30 million children have no access to immunization. A pioneer in the development of edible vaccines, Arntzen remains optimistic, despite the daunting statistics. Inoculating children in poor, remote corners of the world is nearly impossible with current technology, he says. All traditional vaccines must be injected. The only exception is the oral polio vaccine, and Arntzen and others see no coincidence in the fact that polio has been virtually eradicated. The oral polio vaccine, although no longer used in the United States, was made from a live, weakened form of the virus, grown in monkey kidney cells. The vaccine is nearly 100 percent effective but carries the small risk of causing full-fledged disease. It can be delivered orally because even the weakened virus, unlike most viruses, survives long enough in the stomach to trigger the immune system. Most vaccines, however, must be injected, requiring needles and trained medical workers. What's more, conventional vaccines must often be made in expensive bioreactors -- which are simply unavailable in many regions. To refrigerate vaccines for wide distribution poses enormous logistical and financial costs, and may be impossible in remote areas that lack electricity. 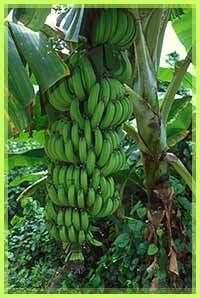 Bananas, like these in Puerto Rico, could provide an ideal medium for edible vaccines. Anson Eaglin, USDA. The problem has driven Arntzen since he attended a 1990 conference in New York City, sponsored by the World Health Organization. There, it occurred to him that some plants might be easily genetically modified to produce the proteins that would trigger the human immune system, much like traditional vaccines. Soon afterwards, as Arntzen watched a young Thai woman feed a slice of banana to her crying child, he had an epiphany. What if a crop that grew so easily in developing countries could be designed to deliver vaccines? That would improve access to basic vaccines -- and give struggling agricultural economies a shot (heh heh) in the arm. It was a simple idea, but making it work has required sophisticated science. And Arntzen, seasoned by a decade of research in the field, now knows his early fantasies were a bit naive. Roll up your sleeve. How do ordinary vaccines work anyway?